in my past entry and I want to apologize that this came a little late. I had problems with my internet service provider and just for the sake of blogging, I subscribed to a 1 day unlimited surfing via prepaid. 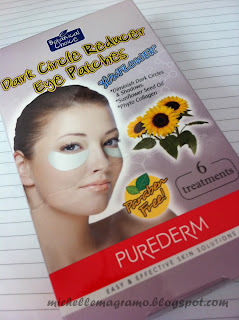 PUREDERM Botanical Choice Dark Circle Minimizing Eye Patches "SUNFLOWER" are specially formulated to diminish the appearance of dark circles, shadows and uneven skin tones under eyes. Sunflower seed oil, vitamin A and E help to make under eye area appear lighter, firmer and softer, increasing skin elasticity. Expiration Date: 3 years from manufacturing date. Will I recommend this product?If for the cooling effect, yes. But if for the dark circle reducer, no. 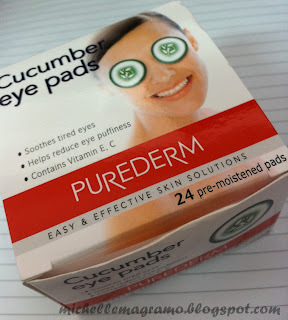 Purederm Cucumber eye pads are soft pads pre-moistened with real cucumber and other soothing ingredients. 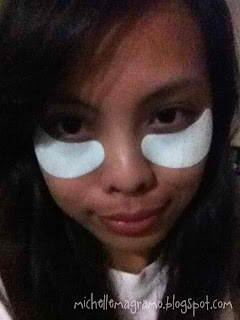 These pads are specially designed to rest on top of your eyes as you lie back and relax. Enjoy the cooling sensation and natural aroma of freshly cut cucumber slices as Cucumber eye pads soothe your tired, stressed eyes. 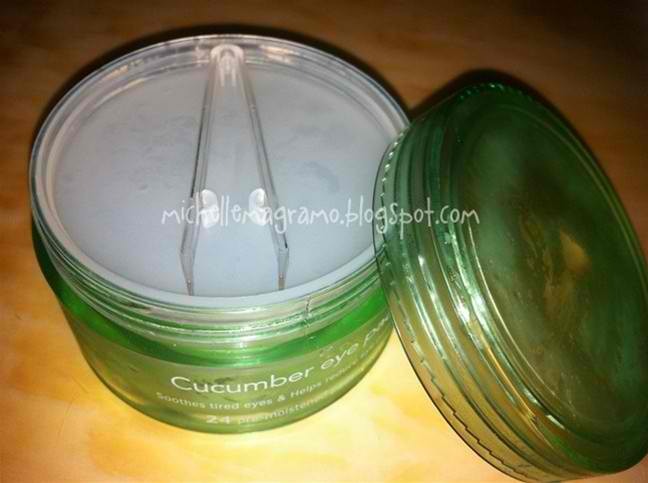 After just one use, you will feel your face refreshed and soft. Aqua, Glycerin, Butyene Glycol, Cucumber extract, Portulaca Extract, Imidazolidinyl Urea, Camellia Sinensis Extract, PEG-40 Hydrogenated Castor Oil, Mulberry Root Extract, Methylparaben, Hydroxyethylcellulose, Allantoin, Tetrahexyldecyl Ascorbate, PEG-60 Hydrogenated Castor Oil, Fragrance, Tocopheryl Acetate, Sophora Japonica Extract, Licorice Extract, Propylparaben, Disodium EDTA. Will I recommend this product? YES! I personally love this! Where to buy these products? 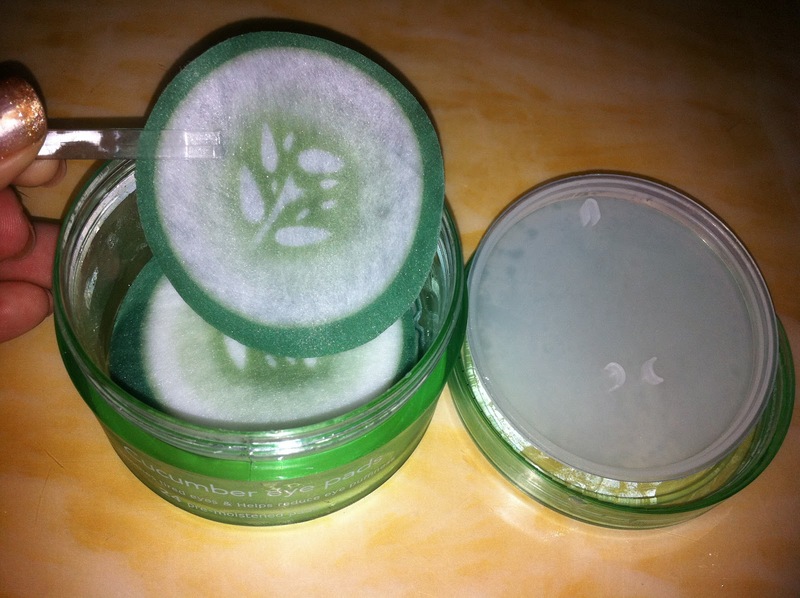 I agree with Janet, the cucumber pads looks lovely!